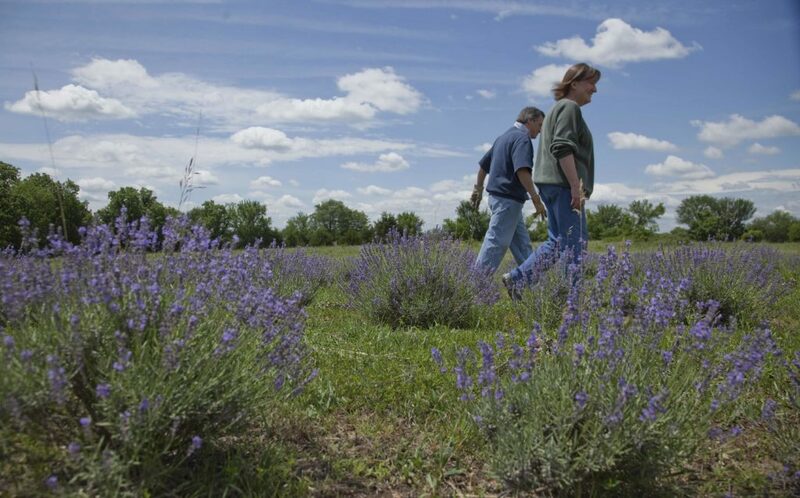 Jack and Kathy Wilson stroll through their Washington Creek Lavender farm southwest of Lawrence. 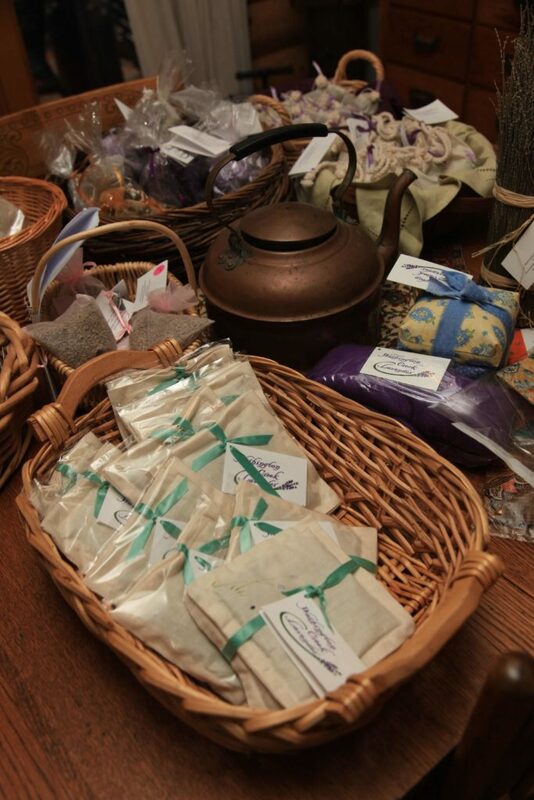 The Wilsons grow and dry lavender to fill sachets, reusable dryer sheets, neck comforters, eye pillows, and coasters. They also bundle dry stems for firestarter and grow some culinary lavender. The farm is certified organic. 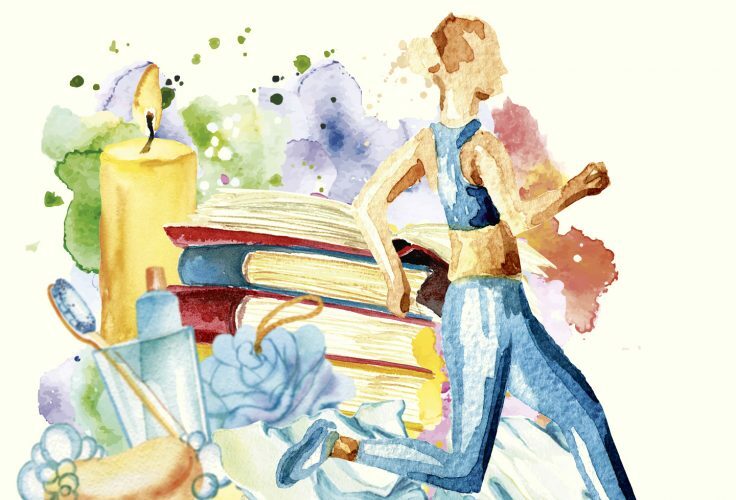 lavender Dryer sheets and sachets for clothes drawers are just some of the products Kathy Wilson has come up for their product. At Washington Creek Lavender, cresting the hill to a field of lavender stems swaying in the breeze feels more like visiting the Mediterranean than a farm in southern Douglas County. I was already of fan of this aromatic herb, but I have a new respect for lavender after visiting with farm owners Kathy and Jack Wilson. The Wilsons grow and dry lavender to fill sachets, reusable dryer sheets, neck comforters, eye pillows, and coasters. They also bundle dry stems for firestarter and grow some culinary lavender. The farm is certified organic. Lavender is mostly known for its soothing scent — its ability to calm and sedate individuals is research-proven. Although other studies regarding the herb have been somewhat limited, the University of Maryland reports that lavender could potentially be helpful for treating insomnia, alopecia (hair loss), anxiety, stress and postoperative pain. Lavender is a good crop for northeast Kansas in the right soil — the plant flourishes in hot, dry summers and has few pest problems as long as the soil drains well. Kathy says she and Jack were not set on growing the plant when they purchased the farm, though. “We had the soil tested to find out what would grow best on the land, and it came back with lavender or grapes,” she says. She and Jack spent some time weighing the pros and cons before deciding to go with the aromatic herb. They planted a “test plot” of different varieties in 2005. They also experimented with tomatoes and basil prior to seeking advice with soil type in mind. “We started out with some of the common varieties you can find around here, like Hidcote, Munstead and Lady,” Kathy says. She and Jack quickly learned that while these varieties were fine for the Kansas landscape, there were better lavender choices for the aromatic sachets and other products they hoped to produce. Washington Creek Lavender now grows Grosso, Buena Vista, Royal Blue, Gros Bleu, Edelweiss (white) and Melissa (pink) varieties. The Wilsons have added plants each spring/early summer and lost a few to the weather. After their most recent planting, they have about 7,000 lavender plants on the farm. The different varieties become ready for harvest over a several week period during the summer — Kathy was just finishing the harvest of Buena Vista lavender when I visited. Stems are cut from the plant with scissors and bundled to be hung and dried on racks in a special drying room. Dehumidifiers help dry the lavender in humid summer weather. “They hang for three to four weeks in the drying room, which we are going to have to expand after this year,” Jack says. The dried lavender is then used in Washington Creek Lavender’s products. Kathy does all of the sewing of sachet bags, dryer sheets, coasters, etc., and lovingly hand paints a sprig of lavender on each one. The Wilsons joke that Jack tried his hand at painting the bags once, but the business operates better when he sticks to marketing and plowing/tilling the fields prior to planting each year. Jack notes that he’s been counting customers at the Downtown Lawrence Farmers’ Market who have mentioned long-time use of the dryer sheets. “We’ve had more than 60 people tell us they have been using the dryer sheets for over a year,” he says. He has me smell a dryer sheet, squeeze it and smell it again. The scent is stronger the second time, and Jack explains that the lavender continues to release fragrance as it bounces around in the dryer. He takes none of the credit, explaining that Kathy came up with the idea. Besides the Farmers’ Market, Washington Creek Lavender’s products are available at The Merc, Hy-Vee, Pendleton’s Country Market, Au Marché and on the farm’s website, washingtoncreeklavender.com. If you want to see lavender growing in the landscape, you can also check out the lavender in the herb garden at the Master Gardeners’ Demonstration Gardens at the Douglas County 4-H Fairgrounds, 2110 Harper St. Kathy says the lavender grows well there because the soil drains well like it does on their farm. Lavender is probably not a good plant choice for irrigated, high-clay soils.